You are currently browsing the tag archive for the ‘gardening’ tag. 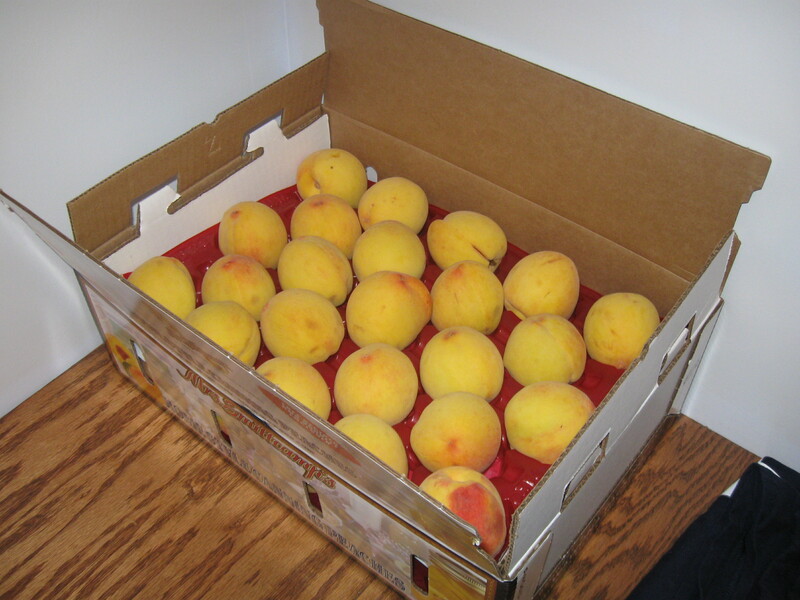 but using a hot water bath to process the jars and peaches to produce an airtight seal. I have an outdoor burner that I attach to an LP tank that is used for a grill, so I can do all the hot work outside and not heat up my kitchen. the cold winter, I love to go down to our fruit cellar and see the bright colorful jars and I can’t wait to open one up and bring back a taste of summer. When the kids were little, I made pint jars. Now that they are older, I’ve moved to quart jars, which is about 1 ½ meals for us. married and moved out to the farm, his mother Celie helped me get started. My daughter Beth helps me now. Now, growing your own food and canning and preserving that food has become quite popular. Who knew we farmers were such trend setters? “The apples are ready”, Dale calmly proclaimed to me the other day. Every fall we make our own applesauce, but this year, the apples are about 2 weeks ahead of schedule. “Really?” was my reply as I went through the checklist in my mind of all the things I needed to get done over Labor Day weekend. Let’s see, Cross Country Ride and Tie and Potluck, laundry, cleaning, another trip to the State Fair for Brett and Adam’s presentations and project judging, a bike ride and more cleaning. Yikes, no obvious open time slot for making applesauce. But on the farm, when the produce is ready, you make time for it. It’s probably the hunter/gatherer in us that drives us to fill our pantries and freezers before winter arrives. Our inner voice also says we need to take care of them all, no matter how much we already have. Even if our freezers and cellars are full, we try to make room for more. This summer the tomatoes came right during State Fair and even though I did my best to make soup, sauce and stewed tomatoes, I just couldn’t get them all. As I walked through the tomatoes, spotting the ones that were pass their prime, I felt bad I couldn’t get to them all. Let’s see, if I would have pulled an all-nighter, I could have made sauce and used some of these tomatoes…..
After finishing some morning bookwork, my sights were set on the apples, with my trusty helper Beth at my side. We began peeling the apples. Fortunately, I have the best Mother-in- Law in the world (Thanks Celie!) She came out and helped peel for about 1 ½ hours which really saved time. My taste tester Beth helps determine how much sugar to add. We also needed to be careful not to have the heat too high and scorch the bottom of the pot. We want nice colored applesauce, not jars with brown flecks in them. (Sounds like something a judge would say). Three hours and three pots of cooked apples later; we’ve processed 14 quarts of applesauce, which will last us almost a year. I’ll make more applesauce later to freeze and I’ll also slice some apples and freeze them for pies and crisps for later this winter. So the apples called and I responded. 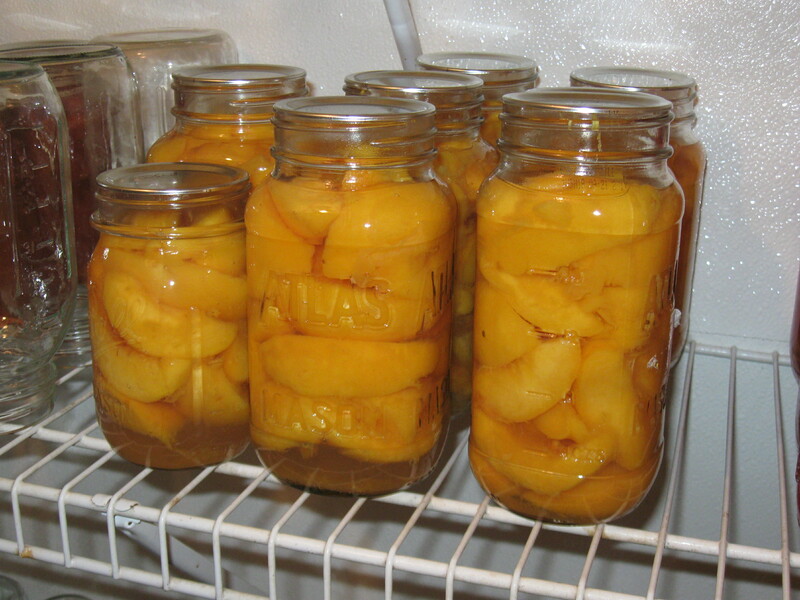 When I put the jars in my fruit cellar and see them lined up with my peaches and tomatoes, a faint smile will come over my face. Yes, it’s hard to explain the call of the fruits and vegetables, but well-stocked stocked shelves tell me the hunter/gatherer in me did alright. I haven’t been feeling like much of a runner or farmer this past week. A cattle show and illness have prevented me from running much and my marigolds are being consumed by slugs. 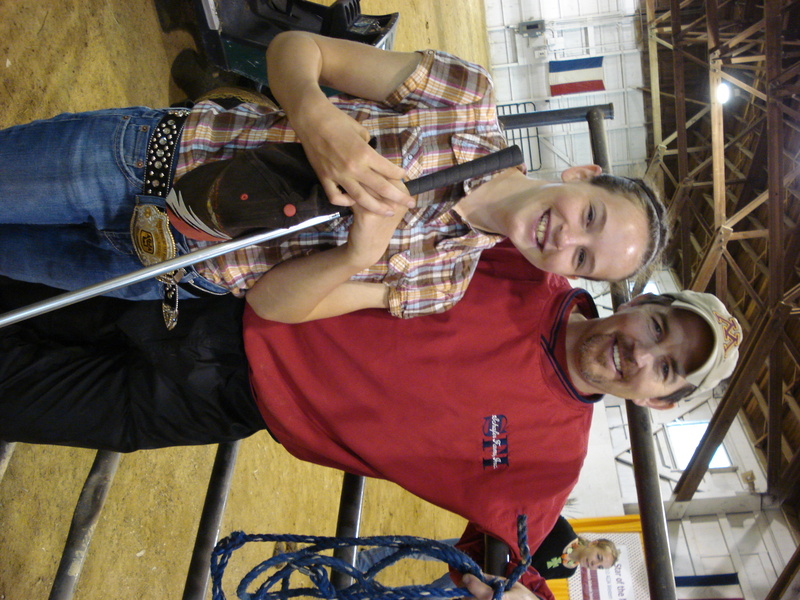 My family spent last Thursday-Sunday in Albert Lea, MN at a cattle show. The days were filled with activities, which didn’t leave any time for running. Minnesota hosted the show so we had the responsibilities of serving meals, organizing events, and providing entertainment. On Saturday evening a fellow pork producer grilled boneless pork chops for supper. They were delicious and got rave reviews! Maddie did very well with her showing and, of course, didn’t find any time for running either. Above are a picture of her and Brandon enjoying the day. Maddie and I have both been fighting some type of cold/flu. I’ve had a sore throat and body aches off and on for a week now and have been feeling sluggish. I’m sure hoping I start feeling better before Grandma’s race this weekend. On Wednesday we have a National Pork Board tour coming to our farm and staying for dinner. It should be an enjoyable event. I’m not meticulous about how our yard looks, but I want it presentable. I was outside this morning pulling a few weeds and found slugs everywhere on my marigolds. They have just about consumed every leaf on every plant. After some quick research, I learned they like beer more than they like marigolds, so now I have some beverages available for the slugs in the flower garden. If I can be rid of the slugs and my sluggishness by the end of this week, I will consider it a success. Wish me luck! Finally some sunshine, I have talked to more people who were feeling bummed about all the cloudy weather. In true Minnesota fashion, once we get warm weather, we get out and enjoy it, and in some cases overdue it. Last Friday was Track & Field day at Adam and Beth’s school. It’s a combination of running, jumping and silly events for the kids to compete in. Adam ran his best 1600 m, with a 5:48 time. He was happy to get the school record. I on the other hand, seemed to have pulled a hamstring muscle. Who knew that squatting down 100 times to measure the long jump could cause muscle strain. Next time I stretch before I measure. Saturday was filled with outdoor chores, mowing the lawn, trimming around the buildings and washing the car. I was able to get in a 15 mile bike ride, which felt really good. Sunday was more lawn mowing and washing the van. Dale was able to finish planting the garden, which meant putting in green beans, sweet corn, tomatoes, beets, muskmelon and squash. Our potatoes, onions, spinach and lettuce that were planted earlier are growing nicely. That evening Dale and the boys went to see Clash of the Titans, while Beth and I stayed home. She rode bike with me as I ran 2 miles. My muscles seemed a little sore, but it was still good to run. I treasure weekends like we just enjoyed. It’s that combination of hard work outdoors, plus relaxing and enjoying the beautiful weather that leaves you with a good kind of tired at the end of the day.